Should we give money directly to the world's neediest? Ngaire Woods looks at the global aid system – and the potential benefits of cash transfers. These challenges are being compounded for developing countries by new financial regulations in the advanced countries that are hampering flows of investment and finance to the developing world. Weakening developing-economy incomes further is a global demand slowdown and commodities crash, which, as Nobel laureate Angus Deaton has demonstrated, has been disastrous for most of the developing world. To cap it all off, the expansionary monetary policies adopted by major economiesare fueling instability. In this difficult context, achieving the SDGs – which would be ambitious even in the best of times – will require monumental effort. To maximize the chances of success will require, first and foremost, that every dollar channeled toward development is used as efficiently as possible. This means rethinking the way aid is delivered and asking hard questions to the elaborate web of international agencies that deliver it, not least about the cost-effectiveness of their operations. While nobody has offered a straightforward value-for-money comparison between the WFP and other providers of relief, some organizations are highly efficient. BRAC, a Bangladeshi development organization known as the “world’s largest NGO,” seems able to deliver aid for a fraction of the cost of Western-dominated international organizations. As the United Kingdom’s Department for International Development pointed out in making its case for a strategic partnership with the organization, BRAC innovates in order to respond more effectively to the specific needs of the poor. For example, it pioneered the use of mobile-phone technology in health care, and championed the provision of cash (or income-generating assets) to those in extreme poverty. Yet that is not what happened in Mexico, when poor families received cash transfers. Instead, their children ended up as well nourished and healthy as those on a food program that cost 20% more to administer. Similar results have been shown in Ecuador, India, and Uganda, as well as in internationalhumanitarian relief programs. And a study in Zimbabwe showed that, as the poor use their newly acquired cash to purchase goods and services from others in their community, they also generate more income for others. 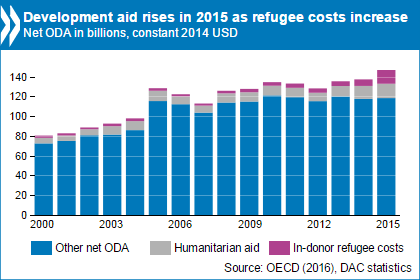 Of course, not all aid can be replaced with cash transfers. But in some cases, such an approach offers the opportunity for huge efficiency gains relative to aid delivered through complex and costly institutions. Imagine eliminating the costs of designing elaborate programs, conditions, monitoring systems, and training schemes for the poor. Imagine a WFP that is no longer arranging the logistics, procurement, storage, and distribution of 3.2 million metric tons of food, and taking 120 days to obtain and move food to recipient countries. The WFP reports that it is increasing its use of cash and voucher transfers. Perhaps it should be pressed to justify doing anything else, and its administrative costs for delivering cash should be compared to those of BRAC.